With pre-selectable torques of 0.26 - 1.48 lbs ft (0.35 - 2.0Nm). Small, light and easy to handle. An ideally positioned rocker switch provides on/ off/reverse. A RÖHM chuck facilitates acceptance of all bit shanks of up to 6.5mm (also for standard 1/4" bits). Housing of glass fibre-reinforced POLYAMIDE. Complete with 16 inserts of chrome molybdenum steel. Direct voltage 12 - 18V. Maximum power consumption 50W. Torques of 0.26 - 1.48 lbs ft (0.35 - 1.0Nm) (the sixth stage bypasses the clutch and yields approx. 1.48 lbs ft (2Nm)). Length 8" (200mm). Weight 415g. We recommend the use of MICROMOT mains adapters of at least 2.0A. The bit holder shown here (50 x 76 x 15mm - 2 pieces without bits), usable for holding rotating bits with shaft of Ø 2.35 - 3.0 and 3.2mm is available as NO 28 359. The MIS 1 is the ideal tool for torques up to 18 in-lbs. It is preferred over the compressed air types because of less costly running expenses, but also for its quietness and cleanliness. The highly flexible cord makes it easy to use. 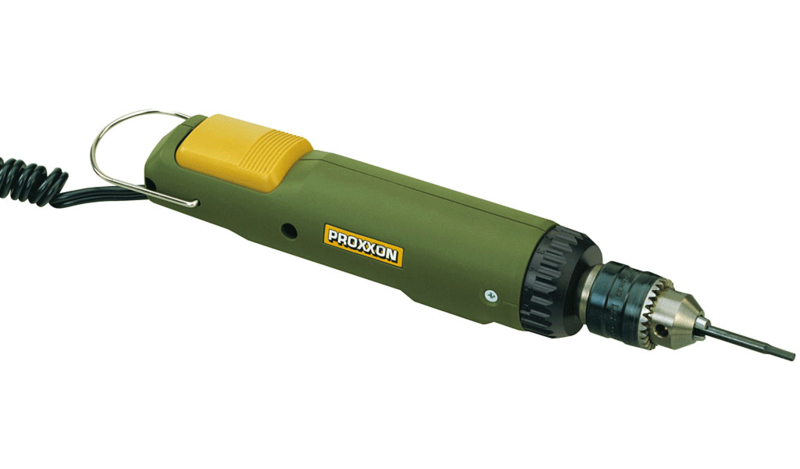 The MICRO Screwdriver MIS 1 is eminently suitable to cut threads!